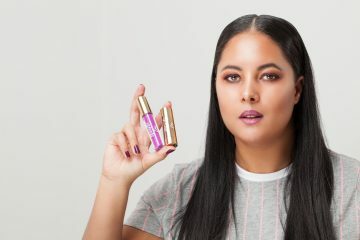 Here at Plus Minus, after a long week running around at London Fashion Week and the changing season, we’ve started to get one thing and that’s our beauty regime. Whilst *they* say you you need to get eight of sleep a night, sometimes it isn’t possible and that’s where the new marine sourced collagen range ‘Bioglan’ comes into play. It contains four new and innovative ways to get your intake of collagen to ensure ultimate absorption and maximum effect. A building block of healthy, youthful skin, collagen is lost at roughly 1.5% per year beginning in our mid-twenties. Most women will have naturally lost almost half their supply by the age of 50 and these diminishing collagen levels result in wrinkles. Collagen supplements enter the bloodstream as bio-active small chain amino acids and proteins that trigger the skin cells to produce new collagen within the skin’s cellular matrix. Taking a supplement is recommended when people notice the first visible signs of ageing such as lines, wrinkles, brittle hair and weak nails. What makes Bioglan’s range different? Reduced Signs of Ageing: Marine collagen is rich in antioxidants, which block free radicals and protect skin from oxidation and ageing. Healthier Skin: Marine collagen has been scientifically proven to help increase skin moisture levels and help protect against the harmful effects of UV exposure and photo ageing. Features Editor, Charlotte, really liked trying the gummies as they were easy to throw in her handbag and take 2-5 throughout the day. The test of time will show if she has thicker hair, firmer skin and stronger nails…. If gummies aren’t for you and frankly you might feel like the whole lot in one sitting, there are other options such as tablets, effervescent and a flavourless blend you can mix into your daily smoothies. There is something for you all. The test of time will be when your friends notice a new healthier looking you! Bioglan Beauty Collagen Powder is a high strength formulation providing 5,000mg of Marine Collagen in each dose PLUS it is flavourless which means it can easily be incorporated into daily foods and drinks without altering the flavour! Add the powder to smoothies/shakes, soups, baking & even sprinkle over yoghurt or porridge. Dosage: Mix 5g powder with smoothie/shakes, soups, water or include in cooking & baking. 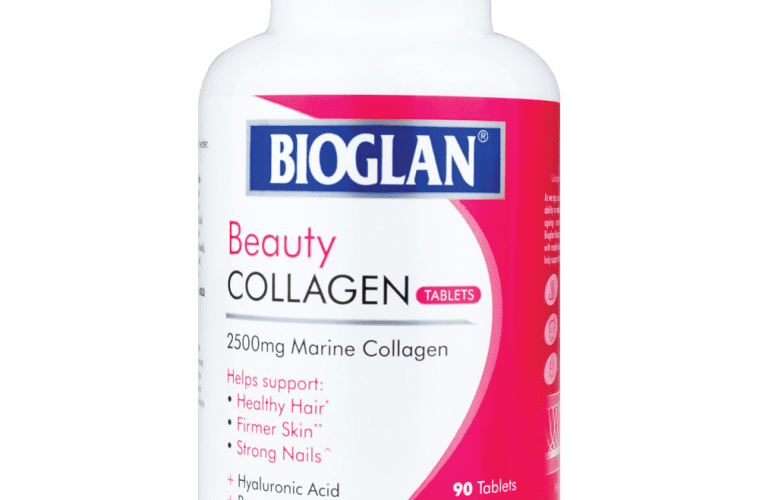 Bioglan Beauty Collagen Tablets provide a high dose of Marine Collagen (2,500mg) per serving plus key skin health ingredients Hylauronic Acid and Resveratrol to provide a unique formula to support Hair, Skin & Nails. Dosage: Take 3 tablets daily. 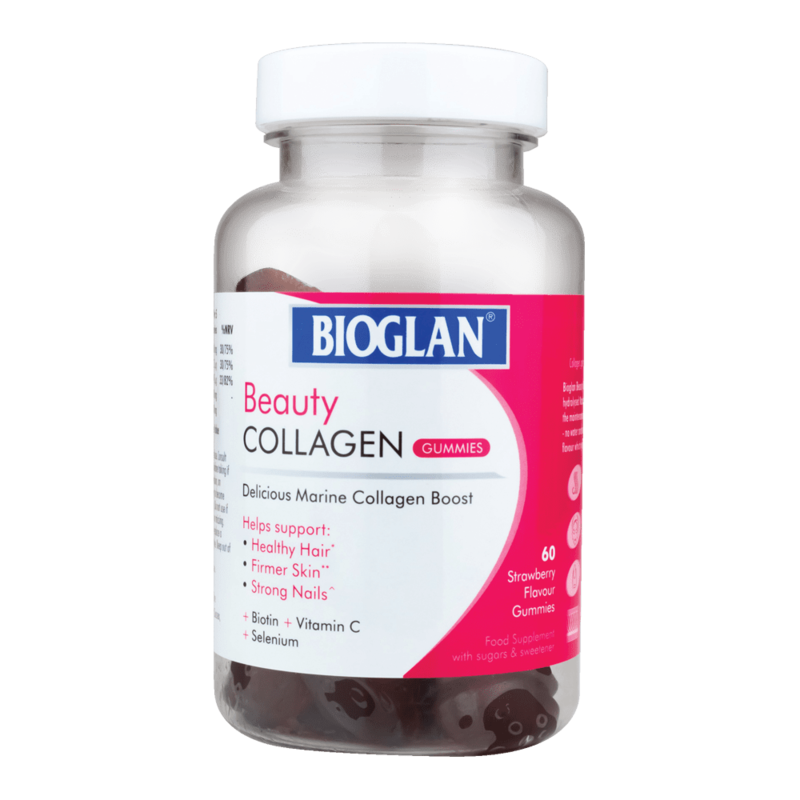 Bioglan Beauty Collagen Gummies- Bioglan Beauty Collagen gummies are the first Collagen Gummy in the UK market dedicated to supporting healthy hair, skin & nails. 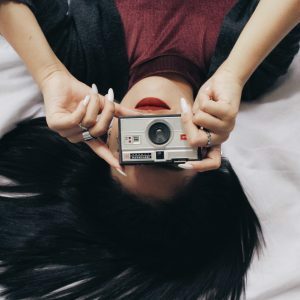 The gummy format is suited to a younger consumer and will provide a top up of Collagen as studies show that collagen production begins to reduce by the age of 25. Dosage: Take 2 gummies daily. 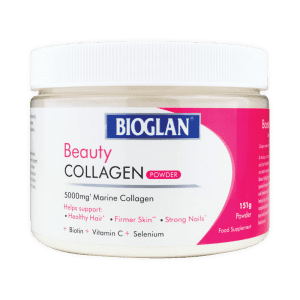 Bioglan Beauty Collagen Effervescent- The latest trend in hydration is all about giving your plain H2O a healthy boost—while also packing some extra flavour. Bioglan Beauty Collagen Effervescent is a delicious tasting berry flavour and provides 1000mg of Collagen to boost your Hair, Skin & Nails. The effervescent format is perfect for a younger consumer both in terms of price point and quantity of collagen required at that age. Dosage: Take 2 effervescent daily.